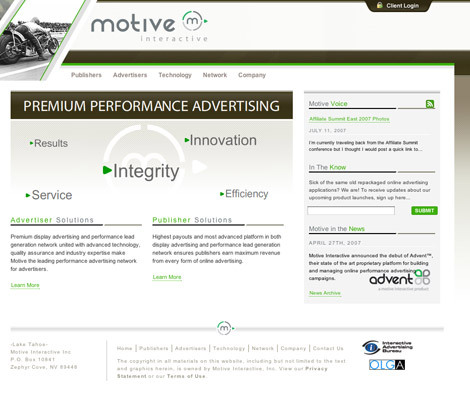 I want to take a second to welcome our newest sponsor, Motive Interactive. They are releasing a new performance ad network and they have asked me to take a look and let everyone know what I think about it. Over the next week I will be playing with their system for a review I will be writing. One of the biggest talking points for the new system is the way it combines a publisher centric advertising network and a direct lead generation network into one synchronized entity. This should be interesting to dive into and I am very much looking forward to making money with their new system! Just wanted to drop a line in here and say thank you for a great review! Motive is excited and looking forward to working with all of you! We are now out of beta and have officially launched the new Motive CPA Network powered by our advent 2.0.